Publication Information: Crown. 2015. 320 pages. Opening Sentence: "The old House on Apple Hill Lane shuddered against the weighty snow that burdened its pitch." Favorite Quote: "We can't force life to do what we want when we want it. We can't change yesterday or control tomorrow. We can only live today as best as we can. And it just might turn out better than expected." 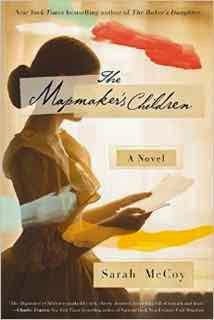 The Mapmaker's Children follows two women - Sarah Brown in the 1850s and Eden Anderson in 2014. Sarah's story is personal and global - the story of slavery, abolition and the time leading up to the Civil War in the United States. Eden's story is about personal sorrow, a house, and a doll. The "mapmaker" is historical figure Sarah Brown, daughter of abolitionist John Brown. John Brown not only believed in abolition of slavery, but also that armed insurrection was the way to accomplish his goal. His unsuccessful raid on Harper's Ferry is said to be a main trigger that led to the Civil War. Unfortunately, that raid also led to his capture and the death of several family members. Prior to that fateful raid, John Brown was an active participant in the Underground Railroad. Sarah Brown became involved because of her artistic skills. She was able to draw maps in pictures - on scraps of paper and on objects hidden in plain sight - for the runaways slaves to follow. Even after the Harper's Ferry raid, Sarah vowed to continue the work. Eden Anderson and her husband Jack move into an old house in New Charlestown, in 2010. Eden in drowning in the sorrow that they are unable to conceive a child. The house is a large one bought in anticipation of a growing family; it now seems to mock her. One day, she discovers the head of doll in a cellar. At first, it seems an additional jab at her lack of children. However, gradually, she is befriended by a neighbor's child, and drawn out of her sorrow and self-pity into a world of new friendships and of new mysteries as to the history of the doll and of her house. The two main characters - Sarah and Eden - seem associated by only a thread. In some ways, their stories are similar; their inability to bear children impacts the course of their lives entirely. Many of their relationships become hinged on that fact. In other ways, their stories could not be more different. Sarah loses so much in her early life; she lives in a violent, turbulent times. Her battle is one of ideals and of changing the world. Eden, however, is leading a comfortable, white collar life. She and her husband are able to afford a lovely home; she is able to leave a career and settle into an an affluent neighborhood. Her activities consist of puppies, bookstores, neighbors, and the project to research the history of her home. The stories do not compare. As such, the book is sometimes frustrating to read. Sarah's story should be the more compelling of the two; it is certainly the more interesting of the two, all the more so for being a fictionalized account of an actual historical figure. Yet, it sometimes reads like a detached description of the time and place. A considerable part of Sarah's story is told through letters; as such, events and people are talked about in a somewhat dispassionate way. The emotions, perhaps due to the time and due to the relationships, seem a distant second and often missing from the letters. Eden's story is told with a focus on the emotions - the way Cricket and Cleo find their way into Eden's heart, Eden's love for her brother, and Eden's relationship with Jack. Her story seems more "alive" than Sarah's, but I am left with the feeling that it should be the other way around. I am left wanting to know more about Sarah and what she felt.